All the Sensors we produce are Intrinsically Safe. Print the PDF below and submit it with your request. For most applications we typically use a 3″ sensor head which fits into any 3″ Slip Style fitting. Regardless of which controls are used this sensor will hold all the sensor tips for all the models. The sensor tip lengths are standard lengths but can be modified as needed for your application by submitting this sensor appendix with your request for quote or your order. We make several different types of sensor heads for your application. Put two or more EXT kits together to get even deeper into the environment. The Sensor can be cut in the field as needed to fit your application. 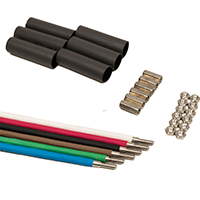 Each sensor tip comes with the part necessary to assemble them together to the Sensor head. These sensors can be cut to length in the field. e.g. WLC-5000-110-EXT3 Is a 110 Volt 5000 Controller with an external static pipe sensor, 3 rod kit and a 50 ft wire lead on the sensor.